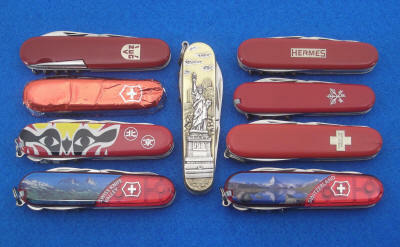 The Victorinox company began life in Ibach, Switzerland as the Elsener Messerfabrik. Karl Elsener started his Knife Factory in 1884, making surgical knives. When he discovered that the Swiss Army was buying its soldiers’ knives from Germany he organized a group of Swiss cutlers to capture this contract. Elsener also wanted to provide employment in his canton of Schwyz. He succeeded at both. The Soldier’s Knife of the 1880s had only a single blade. The Soldatenmesser Modell 1890 was designed to enable the soldier to disassemble his new Schmidt-Rubin bolt-action rifle. Elsener and his Swiss cutlers’ union began making this multi-bladed sturdy pocketknife. In 1897 Karl Elsener designed a lighter model, more befitting a Swiss officer, adding a corkscrew and a second blade to the large blade, leather punch, screwdriver, and can opener of the Soldier. An essential and ingenious feature of the Officer’s Knife is the pair of internal “floating” springs: each spring now controlled three tools. By 1903 the Officer’s Knife had a cross-and-shield emblem almost identical to today’s models. In 1909 Karl adopted his mother’s name Victoria as the company trademark; when the company began using stainless steel for their blades in 1921 the word Inox (for rust-proof) was appended to the Victoria brand to become Victorinox. Karl’s sons Carl II and Alois inherited the company in 1918, and Carl II’s sons Carl III and Eduard inherited the firm in 1950. Carl Elsener IV became Managing Director in 2007 - and Victorinox stills makes the knife issued to the Swiss soldier. "It is a fantastic book!"